Every 6 months we hear the prophet, his 2 counselors and the 12 apostles speak. It happens the first weekend of April and the first weekend in Oct. We recently had a 2 day Conference. I look forward to it every time and study the 15 to 20 min talks when they come out in the Church Magazine. You can get also it on line in just days. Here’s the link. A few weeks before conference President Nelson, heart surgeon by trade, asked us call the name by the full complete name: “The Church of Jesus Christ of Latter-day Saints”, not the Mormons, the latter-day saints, just the full and complete name give to us by the Lord himself. We were told if it was used wrong to correct and use it’s full name. Logical, right? I think so, but not everyone was happy about it. But the “Mormon Tabernacle Choir” changed their name to “The Tabernacle Choir”. Obedience. Then we were told almost immediately that church would go from 3 hours to 2 hours. 1 hour sacrament meetings, 10 min in between and then 50 min of either gospel doctrine or RS/Priesthood. Participate in a 10-day fast from social media and from any other negative or impure media. President Nelson encouraged women to notice how the fast affects their priorities and then to record and act on spiritual impressions they receive. Read the Book of Mormon between now and the end of the year. 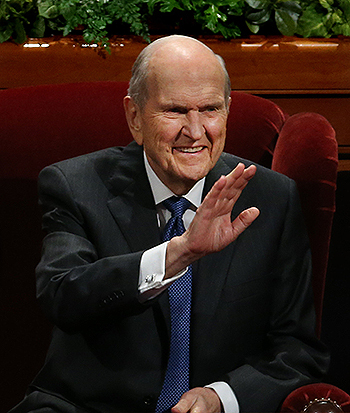 President Nelson suggested that as they read, they mark each verse that refers to the Savior and talk about Him with friends and family. Establish a pattern of regular temple attendance. Time in the temple can lead to greater understanding about how to draw upon God’s priesthood power, President Nelson said. Participate fully in Relief Society. He added that studying the Relief Society purpose statement and the Relief Society declaration can help women understand who they are and who the Lord needs them to be. President Russell M. Nelson invited members find a way to regularly serve and worship in the temple before he announced plans to construct 12 temples, the largest number of temples ever announced on the same day. The Salt Lake Temple and other pioneer-era temples will be renovated in the coming months, he said. This is a lot for all of us. But we are excited!